Mental health awareness week takes place from 8 – 15 October in New Zealand. This year the focus is: let nature in, strengthen your wellbeing. Walking meditation is best done in bare feet, but if that’s not practical choose a soft soled shoe where your toes have plenty of space. Choose a space where you are free to walk. You only need to be able to walk for 10-15 steps so if you’re short on space or time, you can practice walking meditation in your hallway. Stand tall and imagine that your head is floating on top of your neck as if suspended by a golden thread from above you. Bring your awareness down to the soles of your feet. Imagine you are planting your left foot into the ground and slowly lift your right foot until it is hovering just above the ground. Slowly move your right foot out and touch your right heel to the ground. Your right heel should be aligned with the top of your left toes (or go out with your right foot a little further if you are feeling a bit wobbly and need more space for balance). Shift your weight from your left foot to your right foot and as you do follow through by allowing your right foot to plant fully into the ground – heel first, then mid foot, ball of the foot and finally the toes. Your weight should now be 100% in your right foot. Imagine you are planting your right foot into the ground and slowly lift your left foot until it is hovering just above the ground. Slowly move your left foot out and touch your left heel to the ground. 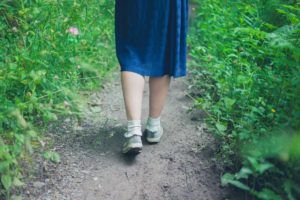 Your left heel should be aligned with the top of your right toes (or go out with your left foot a little further if you are feeling a bit wobbly and need more space for balance). Shift your weight from your right foot to your left foot and as you do follow through by allowing your left foot to plant fully into the ground – heel first, then mid foot, ball of the foot and finally the toes. Your weight should now be 100% in your left foot. You are now in walking meditation. Continue to walk slowly and mindfully. When you have finished walking, spend a few moments standing still, head erect as if suspended from above and notice how you feel.